Summertime is definitely the best time of year, everywhere you go you see fresh fruit and vegetables, and summertime food is simply the best. Being a southern boy at heart, I do love my pies, and nothing beats an old fashioned Peach Pie. I just love walking into the room and smelling ripe peaches, what a great sensation. Then biting into one of those peaches as the juices run down my chin……sigh……now that’s summertime to me. Peaches, Nectarines, and Plums, the holy trinity of stone fruits, but my favorite summertime pie fruit, has to be peaches! Just a plain peach pie with a scoop of vanilla bean ice cream is a wonderful thing, but make a sweet custard, blend in your fresh peaches and throw an nice handful of blueberries, add in a struesel topping and your tasting down home goodness. I do have a go to recipe for this pie, it was standard fair in my restaurant days, and its also something I have not made in quite a few years. I did make a couple adjustments to my pie, one is the addition of Greek Yogurt (my new love! ), and replacing good old Crisco, with my new healthier Spectrum Organic Shortening ( I am trying to be more responsible). I do have to say my pie crust was not quite up to standards so I have to work on it just a bit, but the pie was wonderful! The fresh peaches so very sweet and tasty, and those tart little blueberries adding just another element to that combination of flavors…..sigh……it was a wonderful thing! If you do have a favorite pie crust recipe, please feel free to use your own. Cube cold butter and shortening into 1/4 inch pieces. Sift flour, sugar, and salt together and place into bowl of food processor. Pulse 2 times. Add Butter and shortening pieces to flour and pulse 2-3 seconds until it forms a fine crumb. Add Ice 5 Tablespoons of Ice Water to the mix and Pulse 2-3 seconds until dough forms on blade. Add one more Tablespoon of Ice water if dough seems too dry. Wrap in plastic wrap and refrigerate for at least an hour or up to 2 days. When dough is ready place it on a lightly floured surface and roll it out with a lightly floured rolling pin. Roll dough from the center to the edge to keep the dough round. Dough should be about 1 1/2 inches bigger than your pie dish. Roll dough onto rolling pin and transfer to pie plate. 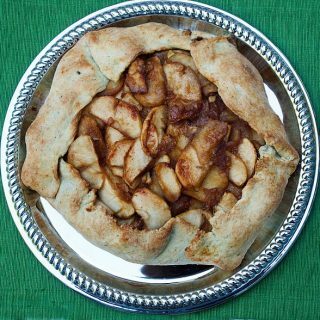 Form to pie pan and from your decorative edge. Keep dough cold until you are ready to fill it. Peel and slice peaches, and place in the bottom of your already made Pie Dough that you already made and fitted into your pie plate. In a bowl with a wire whisk lightly beat your egg yolks, and add Greek yogurt, sugar, flour, and vanilla extract, just until blended and pour over peaches. Sprinkle blueberries evenly over your pie. Bake pie for 25 minutes , while pie is baking make your struessel topping. with your hands combine the flour, sugar and butter until it resembles coarse crumbs, set aside to top pie. After 25 minutes remove your pie and sprinkle your struesel topping evenly over the top of your pie. Return Pie to oven and continue baking for 15-20 minutes or until topping is a nice golden brown. If your crust seems to be browning too quickly when you remove to top with struesel, cover the crust loosely with aluminum foil for the remainder of the time in the oven. Remove pie from oven when done, and place on cooling rack for one hour. You may serve this pie warm or let it cool completely. Summer is also the time we find a glorious bounty of wonderful vegetables, living in New Jersey we do have such a great selection of local produce. When I think of New Jersey Produce four items come to mind, Peaches, Blueberries, Tomatoes and Corn. If you have never tasted a Jersey Tomato, you just don’t know what good is, and our sweet corn is a thing of beauty. My next recipe uses some of that amazing corn. I started by Grilling my corn first to give it some added flavor, I’ve seen many different recipes for grilling corn, rubs, butters, leaving it in the husk or wrapping it in foil. Each one produces a wonderful tasty ear of corn. But I have found for my tastes, just removing the husk and grilling it just till it starts to get a little color is all I need to produce a perfect ear of corn. Since I have been cooking our corn this way, my wife doesn’t even need butter! The corn was so cheap at our farmers market this week, that I bought a little too much, so putting on my thinking cap I decided to try some corn fritters. Now making fritters certainly isn’t rocket science, your basically making a corn pancake. So with that thought in mind I grilled my corn and whipped up a small batch of fritters. They came out so well that my wife suggested that I make a big batch and freeze them…..
Add in Corn, Carrots, Basil and Spring Onions. Sauté for about 90 seconds, the Fritter should be Golden Brown. Turn over fritter and cook until that side is Golden Brown. Fritter should be cooked through, if they still look raw, you may reduce heat and continue to cook longer, or place in 300 degree oven for 5 minutes. Serve with Greek Yogurt and just a Squeeze of Lemon juice. You can also serve it with a Garlic Aioli , Ranch or Bleu Cheese Dressings! I also made a nice Tomato Salad. I had purchased a pint of yellow grape tomatoes at the farmers market, wow, were they sweet! I just cut them in half, threw in some of my home grown tomatoes (my reds were the only ones ready) a couple large sprigs of fresh basil from my garden, a little extra virgin olive oil, a splash of balsamic vinegar, salt and pepper to taste, and voila! Now get out there and find yourself a local farmers market or a grocer selling local produce and get some of summer’s best while it’s still available, and to all my friends down under, you guys will be loving life while we are eating plastic tomatoes…… so hang in there! Love the title of this one. The pie looks fantastic. How about this pie for breakfast, lunch AND dinner? Sage is sitting here with me and she agrees, YUM! Couldn't agree more with the first part of the blog post title. If I had a choice, I would eat dessert first all the time. Secondly, ditto on the fact that peaches, nectarines and plums are indeed the holy trinity of stone fruits. This looks scrumptious! Whoa whoa whoa! I love this fruity combo- you just cannot go wrong with these. I love making pie- I find the butter is good for flavor but the shortening is great for flaking, so to find that balance, up the shortening but keep the butter. Also adding a little cinnamon or spice to the pie dough works wonders too. I love these recipes and I cannot wait to try it. Thanks for sharing! A pretty creative combo in that dessert! Love it! And the corn fritters are definitely on my list of things to make now that corn is fresh and amazing! The pie is sheer inspiration! 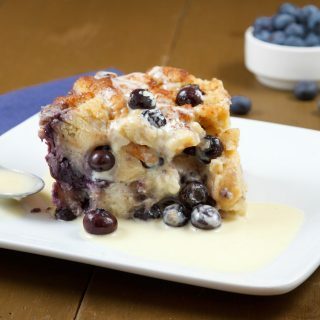 With blueberries and early peaches available here now, this is a must make recipe for me! Thanks for sharing! That pie looks delicious. Thanks for sharing the recipe – as usual. I've always loved peaches and blueberries together and the way blueberries bleed their gorgeous colour into everything they touch! The tomatoes are gorgeous and those corn fritters are calling out my name! I truly love that pie…mmm. I would love to make. Looks really delicious! I want some of that pie! I love peaches and the local ones are just starting to come into season here. Custardy peach pie is now on my to-bake list! That pie looks to die for!!! I'm afraid to make it I might not be able to control myself! Dessert for breakfast and corn fritters? You have no idea how this makes me feel. A blog post to bookmark for sure. Peaches and blueberries are certainly at their best this time of year in Pennsylvania! I was planning to make a cobbler this weekend, but I may have to try your custard pie instead. Yum! I've made your sweetcorn fritters tonight – though I sub'd the basil for deseeeded, chopped red chilli. I love your blog! Beautiful photos and delicious recipes. Thanks for sharing! 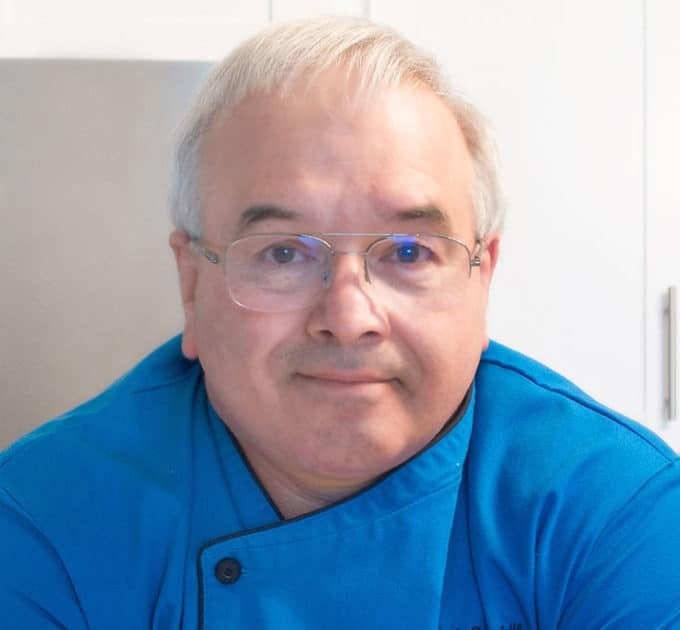 Chef Dennis…thanks for the mouth-watering summertime pie custard and the basil corn fritters looks delish too . 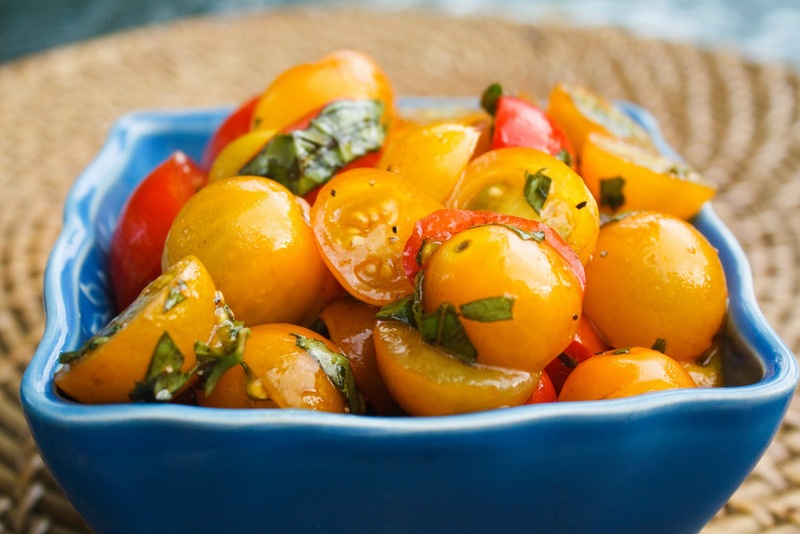 I love your tomato salad…never thought of using basil leaves …I uses italian parsley most of the time…perfect with the balsamic vinegar..my favourite!!! I have not tried Spectrum Organic Shortening before! Thanks for letting me know about it. I'm gonna keep my eye out 😉 Have a great day! What a fabulous selection of dishes! The pie looks particularly amazing–I'd always choose dessert over just about anything! All of your dishes look amazing, so vibrant and colorful. I can almost taste them! That pie and the fritters look divine! Funnily enough I was going to ask if you had any good peach recipes as I just went peach picking. Do you have any non-dessert peach suggestions? thanks for letting me know you made them, and I am so glad you like them…your pepper sauce sounds like a wonderful accompaniment! I just made the corn fritters and had them with Roasted Yellow Pepper Sauce. Yum! Thanks for the recipe. beautiful dishes, and the peach pie…wow, just yum!!! yes to everything!!! first you had me at the trance-inducing Peach-Blueberry Custard Pie, and THEN you show me the corn fritter? the only hard part is what to start with first? Okay, I have to make those corn fritters right now! 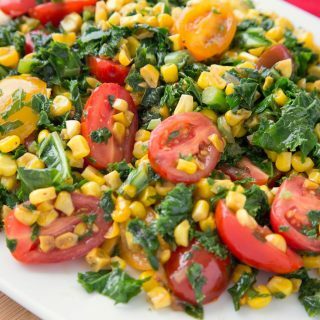 I'd love some of your corn fritters and tomato salad today, to go with the salmon we are going to grill! Later this summer when we have fresh corn, I want to try grilling it, too. Yum! Your photos are always breath-taking. The Greek yogurt in your peach pie is something that caught my attention and I would love to try. I have just started baking with Greek yogurt and have been loving the results. A lot like sour cream for adding tenderness and extra moisture. 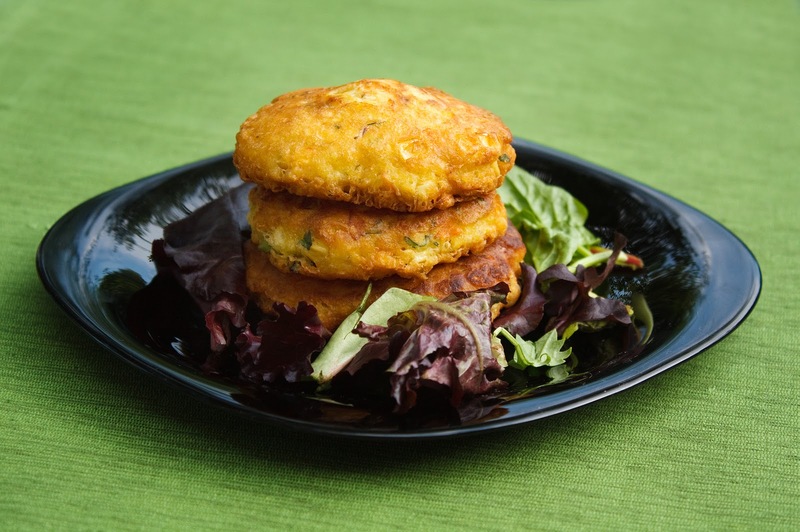 The corn fritters recipe looks perfect and screams summer. I just did a tomato salad and used a Napa Valley white wine vinegar with olive oil. I will try the balsamic next time. I wish we could can every bit of summer into jars for winter and spring =)! Thanks for visiting my blog! Can you believe that despite growing up in SC I still haven't partaken in the tradition of peach pie? Hopefully, I'll employ your recipe sometime soon. Beautiful photography! All of this screams one word.. DELICIOUS! I used to live in Georgia so I know how you feel about peaches 🙂 I don't even like corn but those fritters look amazing.. Man I need to go buy some peaches.. I love peaches as well and you just reminded of what I can't have! Fresh peaches are insanely expensive over here. I'm intrigued by your use of Greek yoghurt. Love it! Your pie looks amazing. I have never seen a custard pie topped with fruit and crumb topping. It must taste incredible:) I love fresh peaches too. Your corn fritters look equally delicious. Great flavors…definitely would love these. 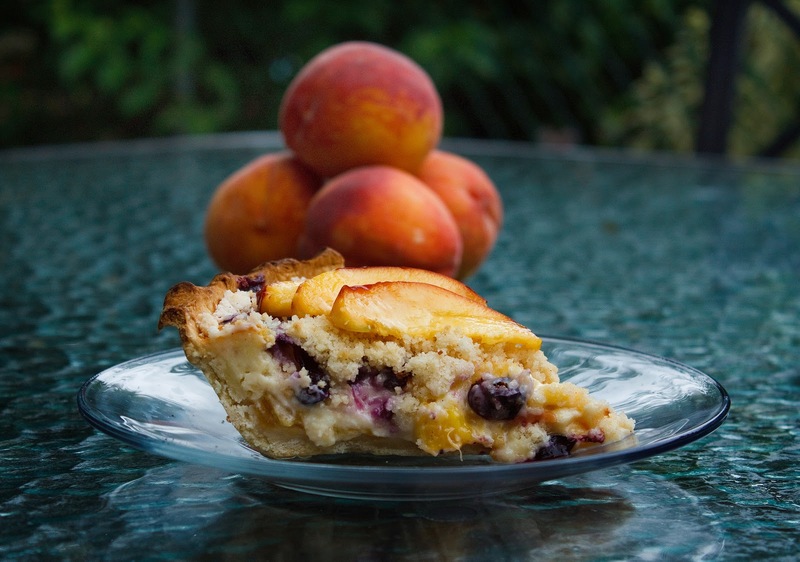 I love the peach/blueberry combination of your pie and the addition of Greek yogurt – perfect! I am enjoying the fresh corn and I finally got my first taste of the year of vine ripened NJ tomatoes – delicious! Mi ripeto sei bravissimo, prepari sempre piatti prelibati, quella torta con pesche e mirtilliuna vera delizia. Buona domenica Daniela. you too are enjoying the best uses of Greek Yoghurt? Amazing. Me + Yoghurt are friends. And I'm always trying to find ways to use it and your peach/blueberry custard pie is just what summertime desserts ordered. Brilliant! also loving the fritters and your tomatoes remind me of how crappy our farmer's market is. lol. Now I'm really jealous! Our little market in northern Ontario leaves much to be desired. I love the way you tempted us with that peach dessert first; great post. I love your blog. You have inspired me to make corn fritters with the fresh corn I just bought! And with fresh tomatoes and that peach custard pie – such a gorgeous celebration of summer! I will have summertime pie anytime! oh my goodness, Dennis! I hate that I missed dinner again at your house. Wowza! That all looked soo good. I haven't heard of that organic shortening. I wonder how it would do in flour tortillas. I might need to look that up. 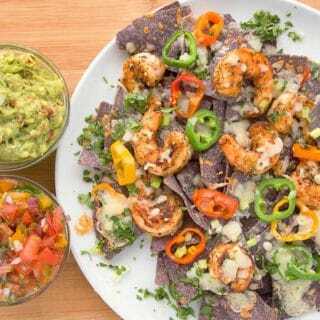 We have a recipe that doesn't use lard because we try to cook healthier; however, the tortillas that we had last night at the Mexican restaurant are definitely different than what we make at home. The difference is the lard, I think. We, also, just grill the corn simply as you do. We find that really that is all that is needed. Lately, I've been cutting it off of the cob after grilling and tossing it in my salads. Yum! What beautiful dishes! You need to open a restaurant in California! MAN this all looks amazing!! I am SOOOOOOO making those corn fritters. It looks like something even I can tackle! You had me at the pie! I totally agree about the wonderful stone fruits that we get in the Summer. We definitely need to enjoy them while we can and this pie certainly is a wonderful way to do that! Dennis, you are speaking my language – butter, butter and more butter. That pie looks WONDERFUL! Yum! I think I might have to make those corn fritters too! Hubby would LOVE those! Gah! Halfway through the summer and the only thing I've made with peaches so far is a batch of ice cream. I need to get on the ball! I love your phrase "the holy trinity of stone fruits" 🙂 A plum cake is also on my summer cooking list. The Basil corn fritters look awesome! With Basil growing in my garden (it's the only thing that never stops growing), I think I'll give then a try! I want to be one of your students, so I can get to eat all these yummy foods you share with us. 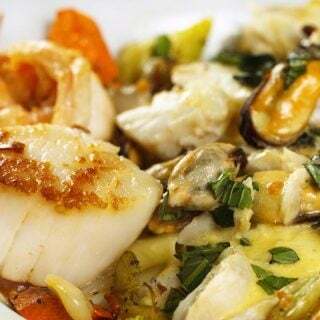 the best thing about your meals and desserts are the amounts of fresh ingredients you use!! All of these look delicious, but I have to say that the pie is really calling to me. I love peaches so much, plus the custard part is a great idea. It's so wonderful to have all these beautiful fruits coming into season for the summer! 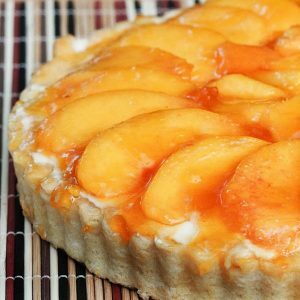 Peaches are getting sweeter and I'll soon be making desserts like the one you've showcased for us here…yummy! oh, how gorgeous. not just the pie (which is tops for me, of course), but also the fritters and maters. masterful work, dennis! I just found your blog via a comment on mine. What a wonderful place. I'm definitely adding you to my reader. Beautiful photos! Mhm, I love corn fritters! Yum! Everything else looks absolutely delicious, too. Brilliant. yep, love peaches too, as a child we would take a 3 hour drive to north Alabama mid June just to get Clanton peaches, some of the best around, freestone… bring home a backseat full of baskets (where I had to sit) and sneak one every now and then so I know about the juices running down the arms, kind of hard to hide that. Those corn fritters look so perfect! I have to make them. And the streusel topping on that pie made me swoon. Peach pie is my all-time favorite fruit pie. I just love this pie! And the corn…I must definitely buy some corn and try your recipe! My mother made corn fritters all the time…never with basil or carrots though. I still make her basic recipe…next time I'll try yours. How did you know??? I have a mointain of blueberries, four ears of corn, and an exploding basil plant. Now I know what we're having for dinner – your lovely corn cakes followed by that amazing cusard pie. Yum! Wow I love this pie! It's so summer perfect! First visit to your site – wow! Your recipes are amazing. I love the sound of the peach blueberry custard and basil corn fritters. Nothing is better than the smell of fresh summer produce…especially peaches. I made a peach blueberry pie last summer and loved the flavor combination…this custardy version is next up on my list!